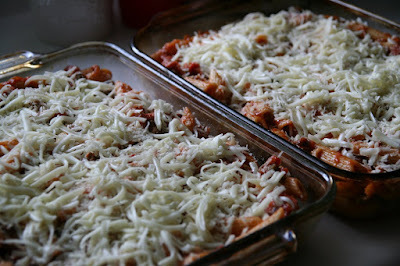 This is a DELICIOUS casserole that is sure to please even the pickiest eaters!!! The first time I made this, I made one for us and one casserole for a family with an ill mother. She told me later that, aside from the mushrooms, every child in her family ate a second helping!! I LOVE Taste of Home magazine. This is yet another great tasting recipe from them!! Cook pasta according to package directions. Meanwhile, in a Dutch oven, cook the beef, sausage, mushrooms, onion and green pepper over medium heat until meat is no longer pink; drain. Drain pasta; add to the meat mixture. Stir in the tomatoes, sausage and garlic spaghetti sauce, salsa and pepperoni. Divide half of pasta mixture between two greased 13-in. x 9-in. baking dishes. Sprinkle each with 1/4 cup Swiss cheese, 1 cup mozzarella cheese and 1/3 cup Parmesan cheese. Spread 3/4 cup of three-cheese spaghetti sauce over each. Top with remaining pasta mixture and three-cheese spaghetti sauce. Sprinkle with remaining cheeses. Cover and freeze one casserole for up to 3 months. Cover and bake remaining casserole at 350° for 25 minutes. Uncover; bake 10 minutes longer or until cheese is melted. To use frozen casserole: Thaw in the refrigerator overnight. Remove from the refrigerator 30 minutes before baking. Cover and bake at 350° for 45 minutes. Uncover; bake 10 minutes longer or until cheese is melted. 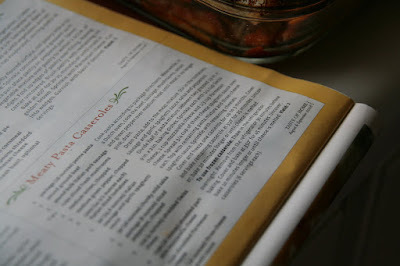 Yield: 2 casseroles (6 servings each). Sounds yummy!! Might have to make this tonight for our Referral Party!! Yeah.. I said it!! We have a little girl from Hunan!! Lynn - Congratulations on your little blessing!!! Mrs. U - Thanks for including the freezing directions! I'm trying to learn to plan ahead and I'm amazed at all the things I can be freezing if I'll just take the time!